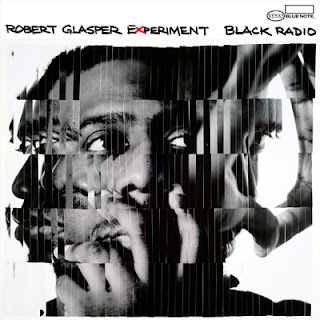 ‘Black Radio’ will certainly be looked back upon as the album that rocketed jazz pianist Robert Glasper to a brand new plateau, and I imagine if his new album isn’t already on your radar then it must already be rocking your iPod and/or CD player. Well let me correct myself first of all as this should officially be credited as the first full-length release of ‘The Robert Glasper Experiment’. For some years now, Glasper has divided the output of his music between The Robert Glasper Trio and the aforementioned Experiment, but if either of them was going to propel him towards becoming a household name, it was always going to be the Experiment - the more traditional and classic approach to jazz by the Trio could never compete with the more genre-encompassing and versatile spin of its sister band, which comprises a stellar list of members. Derrick Hodge (bassist and producer, having worked with Common, Jill Scott and Gerald Levert), Chris ‘Daddy’ Dave on drums, who not only played throughout Maxwell’s last album release BLACKsummer’snight, but also most recently joined D’Angelo on his 2012 European tour, and Casey Benjamin whose vocodered voice can be heard all over 'Black Radio', has notched up performing credits with Saunders Sermons and his own group, HEAVy. Perhaps surprisingly, Glasper has made no bones about the fact this is a direct crossover-targeting album (I mean, it’s obvious when you look at the line-up of guests, but you’re not really supposed to say it, are you?!). As I say, the line-up does scream of that being the intention as it boasts, although a logical selection of R&B and soul vocalists, it’s a slightly predictable one as well - Musiq, Chrisette Michele, Erykah Badu and Ledisi are amongst the names added to the mix, along with rappers Mos Def, featuring under the name Yesiin Bey (why and when did that happen?!) and Lupe Fiasco. As great as many of the guest features are, it’s certainly the band that are the stars here - with immaculate production on a near flawless album, it’s actually difficult to not just hand Chris Dave the crown as the drumming is perfection throughout. Standouts are far too many to delve into but, not to discredit other songs, ‘Why Do We Try’ (f/t Stockley of Mint Condition), ‘Afro Blue’ (f/t Erykah Badu), 'Move Love' (f/t KING) and the bonus track, ‘Fever’ (f/t Hindi Zahra) are simply awesome. A selection of covers have also been tackled here: there’s an almost unrecognisable, but genuinely exquisite, cover of Sade’s ‘Cherish The Day’ with Lalah Hathaway, David Bowie’s ‘Letter To Hermione’ is employed masterfully by long-time Glasper friend and collaborator, Bilal, and the song that sounds like it would have been an absolute disaster on paper, a cover of Nirvana’s ‘Smells Like Teen Spirit’, which is - surprisingly - sublime. Jazz projects like this are always exciting - the most notable comparison I tend to draw on is jazz trumpeter Roy Hargrove’s off-shoot soul/funk project, The RH Factor (whose spin-off group was very much created in the same vein as the Experiment) and their debut effort, ‘Hard Groove’, whose new sound and line-up of guests, including D’Angelo, Erykah Badu and Q-Tip, were used as glorious bait to lure fans from the soul world to a new and exciting world called jazz. In this instance though, it doesn’t seem like Glasper is trying to lure fans over to this new and exciting world, he’s crossed over to the soul one and decided to set up camp there for this project. Perhaps some instrumental numbers might have acted as more of an incentive to entice new listeners to delve through Glasper’s back catalogue? Glasper’s next project (aside from the follow-up remix EP that dropped in October 2012) will certainly be intriguing - will the collaborative nature of the Experiment continue to reign supreme? Will he have the confidence to perhaps look past his new fan exposure and revert to the traditional jazz stylings of the Trio? Whatever we’re delivered with, for now, we have a fantastic new album to cherish, and one I was fairly confident upon its February release would walk with ease towards the title of ‘Album of the Year’.